Jean-François Millet (1814 – 1875) was a French painter and one of the founders of the Barbizon school in rural France. Millet is noted for his scenes of peasant farmers; he can be categorized as part of the movements of Realism and Naturalism. Millet portrayed the gravity, hardship, and dignity of common agricultural laborers, but, despite being labeled a "Socialist revolutionary," his viewpoint was less political than fatalistic. 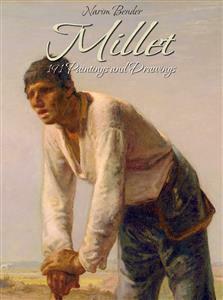 Millet learned Latin and knowledge of the major works of literature from village priests as a child, and in 1833 moved to Cherbourg to study painting. His first Salon submission, in 1939, but his second, a portrait, was accepted in 1840. After his first portrait was accepted by the Paris Salon, he returned to Cherbourg, to begin his career as a professional portrait painter. His first real Salon success was seven years later, in 1847, when he presented his panting The Winnower, which was bought by the government a year later. His success was short lived, however. The Captivity of the Jews in Israel was presented to the Salon in 1848, and it was scorned by the public and critics. This painting quickly disappeared, leading historians to think Millet had destroyed his own work. Occasional failure notwithstanding, Millet’s popularity grew throughout the 1860’s, and he received many commissions, hosting a major showing of his work in 1867 in the Exposition Universeille. The next year, he was named an officer of the National Legion of Honor, and in 1870 he was elected as a jury member at the Paris Salon. In 1875, three weeks before his death, Millet married his wife in a religious ceremony. They had been married in a civil ceremony in 1853. After he died, he left his wife and nine children destitute, spurring the invention of the droit de suite innovation, which allowed a certain portion of the sale or resale of an artist’s work to go to the artist’s family of heirs. His humanity toward peasant life deeply impressed many painters, including Vincent Van Gogh, Claude Monet, and Georges Seurat.